Garden Requisites, a Bath-based company, which specialises in bespoke handwoven English wirework including steel canopies, porches and arches, is warning firms to act quickly if their intellectual property is breached, after a Gloucestershire firm copied its designs and brand identity. 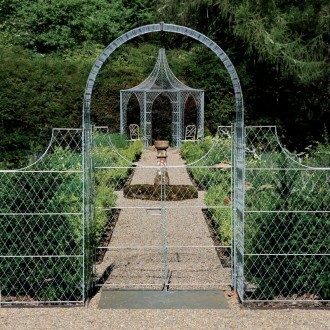 Garden Requisites, based in Batheaston, is run by husband and wife team John and Hilary Thurman who have over 50 years of experience in design and UK manufacturing between them. Its products are handmade in limited production batches or as specific one-off pieces. It first noticed its designs were being copied after coming across a website in August last year, which was selling identical replicas of its products. Hilary said: “We are always aware of what is happening in our market and often search online to keep up-to-date. We came across a firm which was not only blatantly copying our designs, but also the look and feel of our company identity. “We have always taken all possible steps to protect our intellectual property – including signing, dating and recording all original drawings and concepts. It is integral for any firms involved in design to do this, and act quickly if they see any design or copyright infringement taking place. It is not unusual for businesses that create individual and bespoke items to have other businesses trying to copy their designs, and Garden Requisites’, had experienced a similar situation in 2008. Back then, the firm sought the help of Bath-based Withy King Solicitors which settled the matter out of court. Jessica Bent, Head of Technology and Media at Withy King, said: “Garden Requisites contacted us again in 2010. After investigative work we discovered that the firm responsible was based in Gloucestershire. The infringing firm stopped advertising and selling the products at the end of January. The matter was settled out of court.